11-12 Panini Limited Hockey Box Break and Review - Pittsburgh Penguins Hot Box!!! I had some Paypal to burn and was wondering what to bust next, when something occurred to me. I'm a hockey fan and I have my favorite team's logo as my background,but I've mostly been devoting my attention to baseball. It could be two things. One, that's what everyone else is doing. Two, I'm a baseball set builder, but in hockey, I'm mostly a player/team collector. When your collecting habits are skewed that way, naturally, all of your attention goes toward what requires more effort, which is building a set. 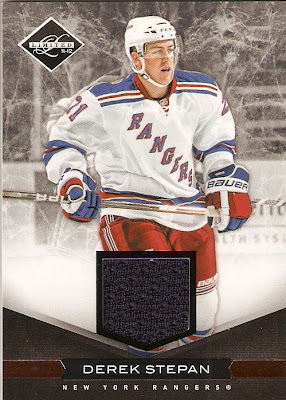 Deciding that I had to do something cool in the world of puck, I settled on a box of 11-12 Panini Limited. This is a premium product featuring seven cards in each box. 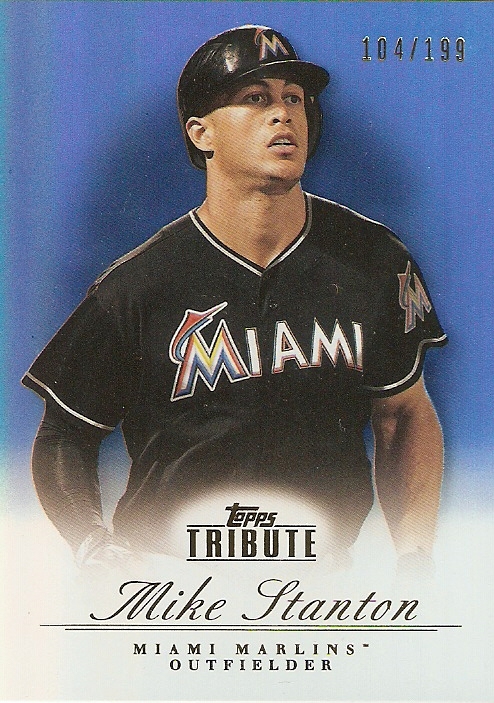 Of those seven, three are "base" cards (two current players, 1 retired player) serial numbered to 299, one is a serial-numbered insert or lower-numbered base parallel, and the final three will be the hits: autographs, jerseys, autographed jerseys, etc. 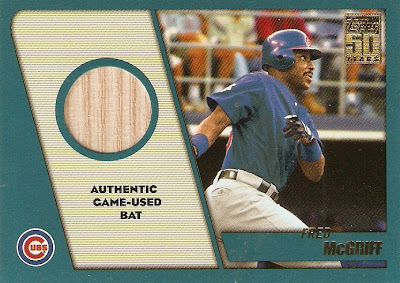 From looking at various Youtube breaks of the product, it typically works out to be: one auto, one jersey, and one prime (multi-colored) jersey. 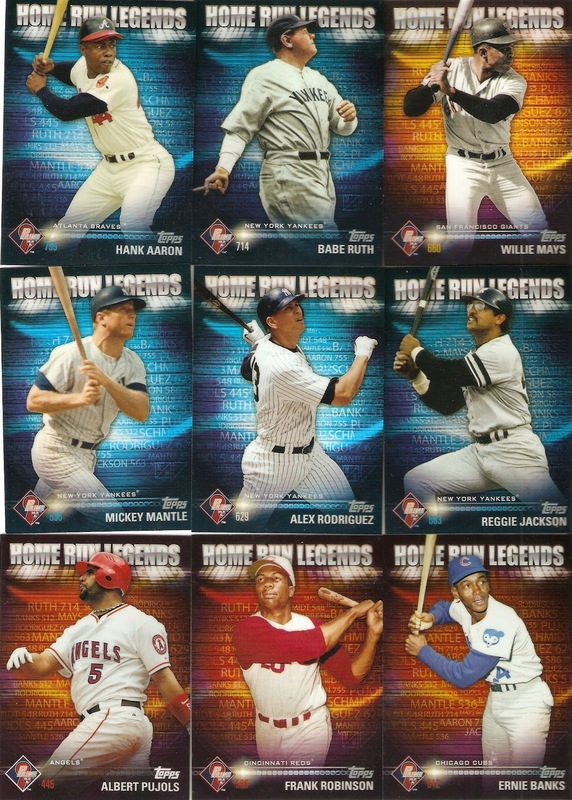 The reason why you skip out on 200+ base cards like you would with other products, is simply because the hits get to be a little more special. You're basically not only guaranteed one autograph and one jersey, but you're promised something really special with that third one. 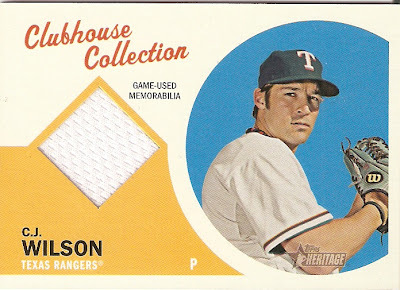 More times than not, it's simply a multi-colored swatch, but in rare cases, the card could be an autographed relic, a multi-player patch card, or a card featuring a piece of a game-used net. Like with any box of cards, sometimes you just flat out whiff. With seven cards in the box and three figures in the bank, the risk is very high with these, but the rewards can be great, but let's face it, there are a lot of dud boxes out there. Fortunately for me, this wasn't the case. To start off with, my box contained eight cards, instead of the supposed seven. I got my three base and my three hits, but I received an extra serial-numbered insert card. Very cool. Without further ado, here's what I received. The card are in the order I pulled them, except for me moving the three hits to the end, mostly for the dramatic purposes. Besides, that last one is worth waiting for. Here we go! 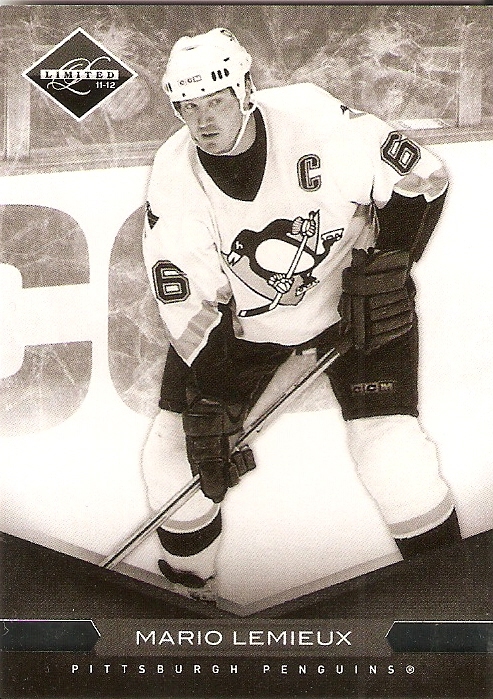 I was a little underwhelmed with the first two, but the Lemieux more than made up for it. The cards have a great look to them. 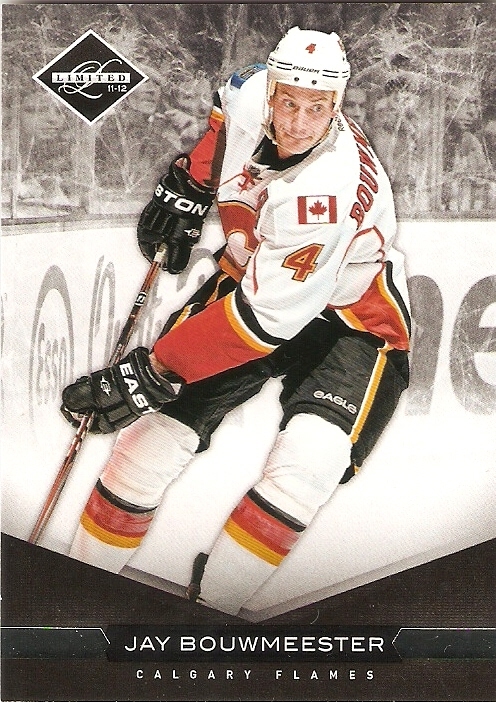 The current players are in full color with a black-and-white background, which really makes them pop. The photos on the retired player cards are in full black, which I like. Even though it's obvious that someone is no longer playing, I think it's a good idea to at least make them somewhat different from the others. 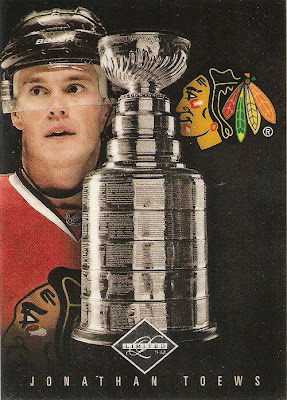 No way around it, the Stanley Cup Winners cards are flat out nice. 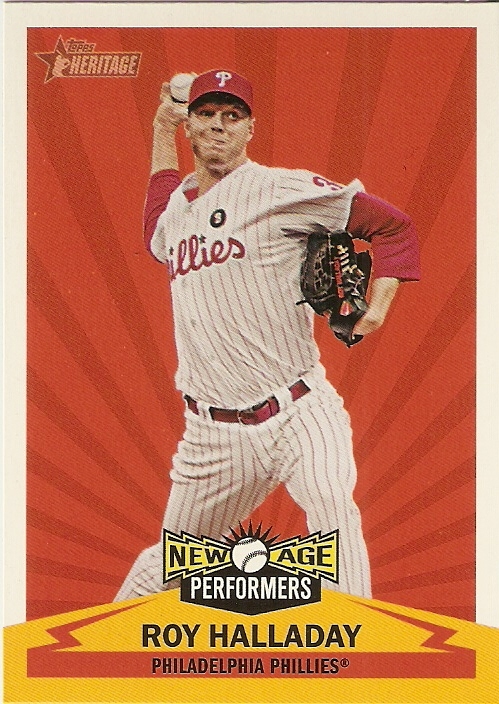 It's impossible to see it, but the card has a little bit of a "Topps Finest" look to it, with the foil, or the embossing, or whatever you would call that appearance. Having a bright shiny Stanley Cup front and center shows what it's all about and the player photo and team logo really stand out. The Crease Cleaners card is nice, but it looks like any other Panini card that came out in any other line. 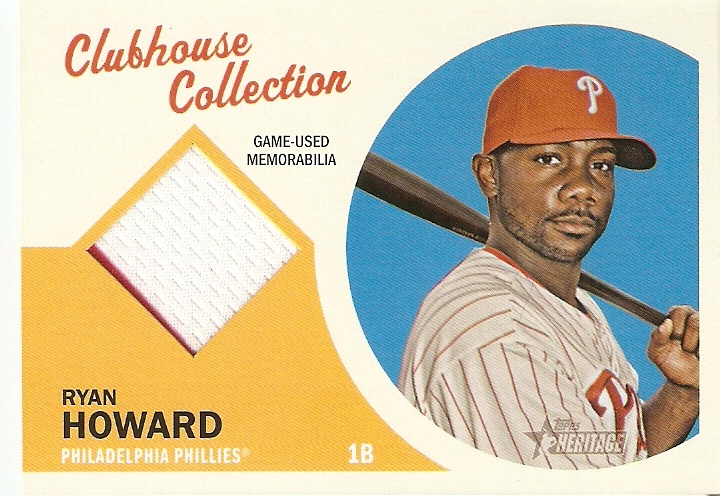 Without the limited logo, it would be just as easy to imagine it coming from Pinnacle or Donruss. With as much money as the consumer has to pay for these seven-card boxes, each card should look like a premium card. 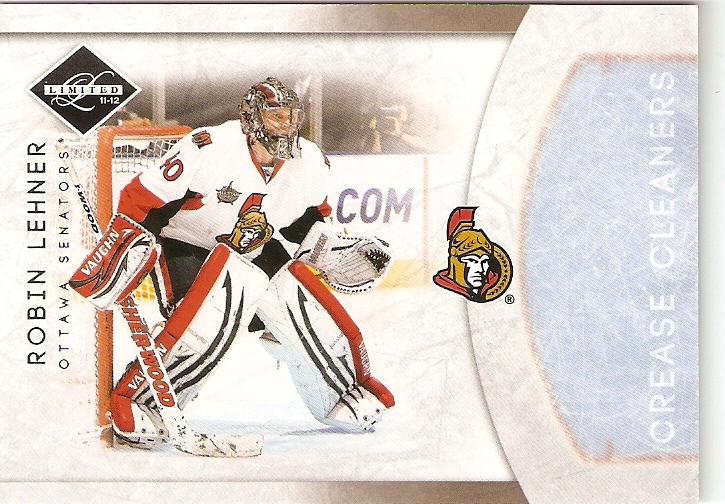 The Toews does, but the Lehner does not. This card ALONE would make the value of the box. 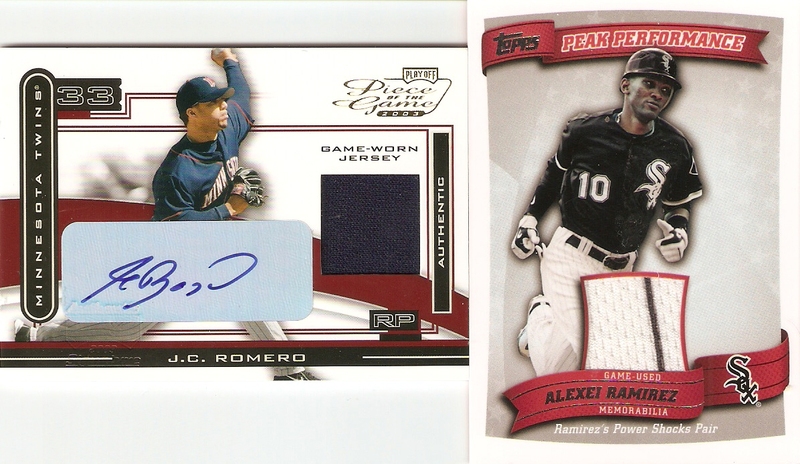 Now I know that Panini takes some flak for recycling their inserts for their autograph and relic cards, but in this case, I'm SO glad they did. It takes everything that made the SCW cards look so great and adds a silver signature on the side. No, I don't care that it's a horizontal signature on a vertical card. The signature is placed perfectly and it being done in a silver paint pen matches it right along with the Stanley cup. Just an absolutely STUNNING card. 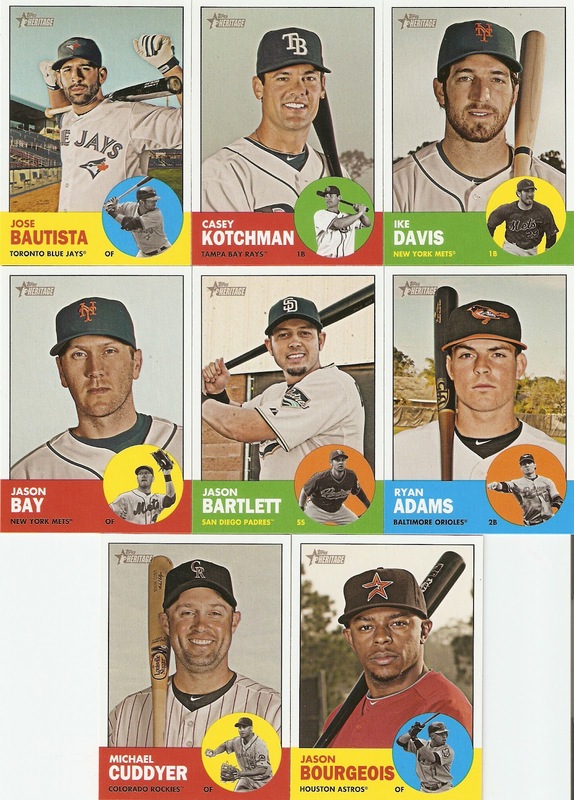 Great job on this one, Panini! Their base relic cards basically take the regular-issue player card, cut a pentagonal (or would it be trapezoidal?) shape out just above the name and throw a piece of jersey on there. 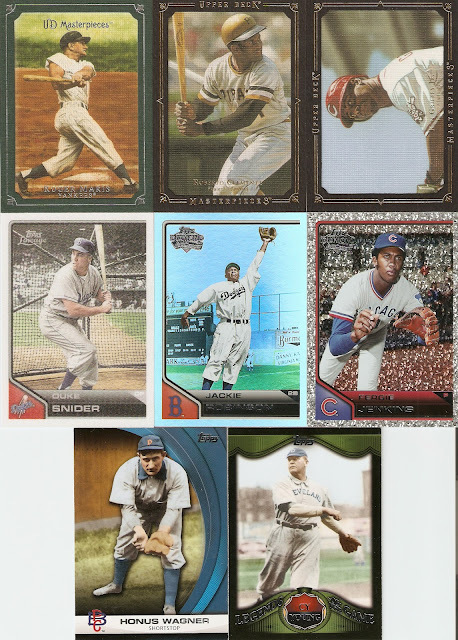 Not the most creative way of doing it, but the way the cards are laid out, it doesn't interfere with any of the photo. 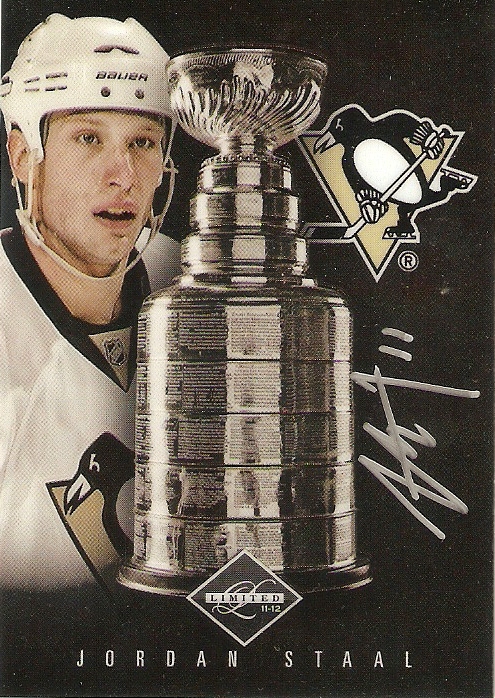 Not a bad-looking card of a player from the Eastern Conference leaders. As if that Staal wasn't enough, I was SO pleased to see this card right behind the Derek Stepan. 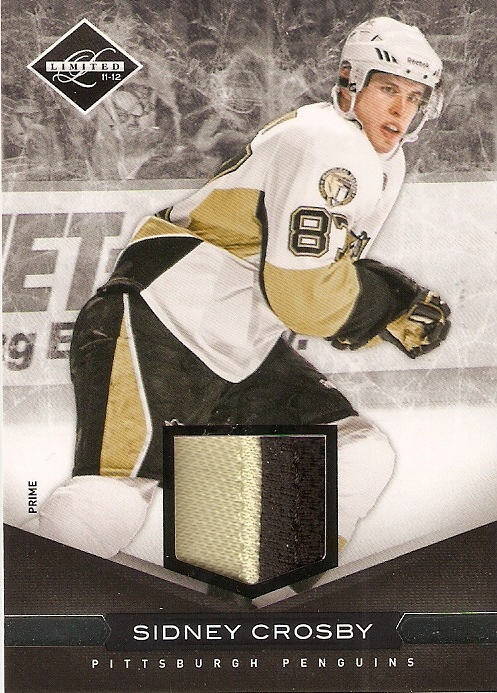 Again, it is a modification of the base card, but what I love about most of Panini's prime swatches in their hockey products is that they seem to make a conscious effort to get the proper placement of the swatch. You get nearly a 50/50 split between the black and yellow and can see the different textures of the two fabrics. The low serial number is great, too. 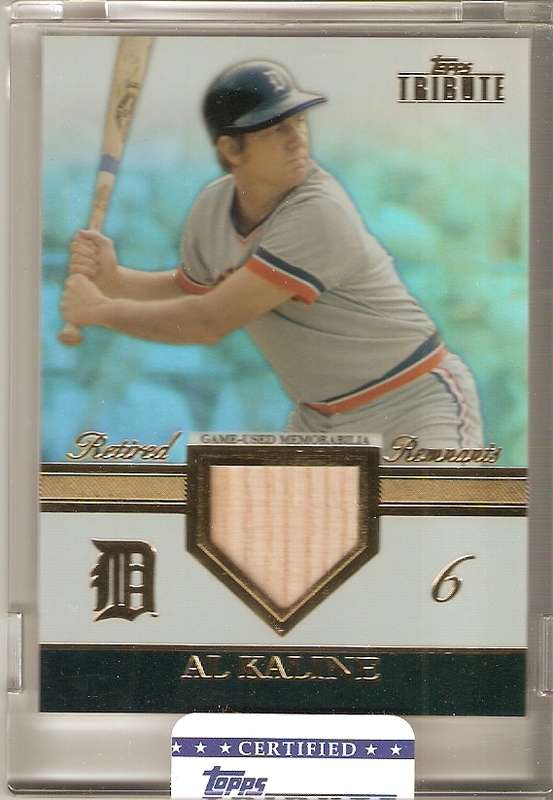 This is EASILY the best card I have pulled this year, and with my budget, it'll probably stay at the number one spot until I wipe the slate clean for 2013. For a Penguins fan, this was nearly a PERFECT box, but let's face it, I got lucky. Like I said earlier, after watching some Youtube breaks, there are A LOT of dud boxes out there, and if mine was one of those, let's be honest, I might feel differently about the product. 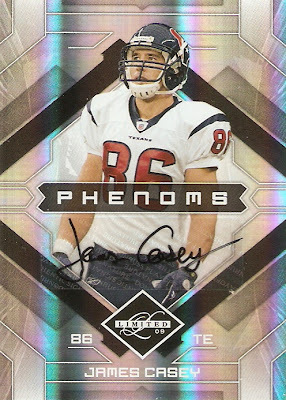 That being said, Panini made a lot of effort with this release, from autograph colors, to prime jersey placement, they really seemed to go out of their way to make this a good product. 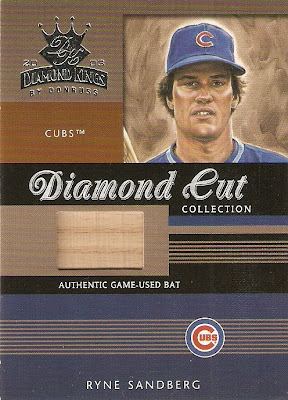 I wouldn't spend all of you card budget on one box of these, but if you have some to spare and don't mind the risk, I'd give it a shot. You might not get as lucky as I did, but then again, maybe you will. Sam at The Daily Dimwit held a trade bait draft recently with the help of his local card shop, and I was lucky enough to be one of the participants. Any time you sign up for one of these, there are always two or three cards you are hoping to get, but I got a little worried when the randomizer gave me position 8 out of ten. 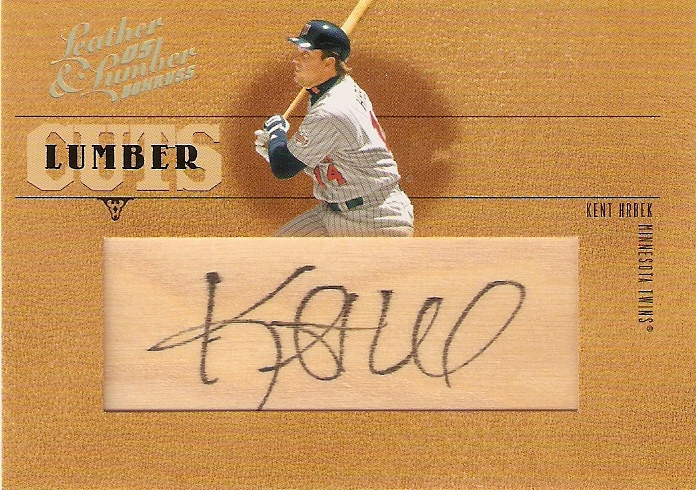 Fortunately, there were not any Twins fans picking ahead of me, and I was able to pick up my number one: a Kent Hrbek autographed Lumber Cuts card from 2005 Donruss. There were plenty of Cubs cards up for draft, but this Hrbek takes me back to when I was a kid watching baseball game with my die-hard Twins fan of a dad. We were lucky enough to watch them win the World Series in 1987 and 1991, and Hrbek was a BIG part of those wins. The great thing about this draft was that the majority of these hits were of REALLY good players, some cards containing multiple pieces. Here's a quick look at what I grabbed. Most of these I'm keeping, but the last two are up for trade. As always, any time I enter a break or a draft at the Dimwit's blog, I absolutely love the cards I receive in return. If you like what you see here, just be sure you don't miss out on the next one. Got a few packages in the mail today from Ebay purchases. The first was actually two packages of the same card. 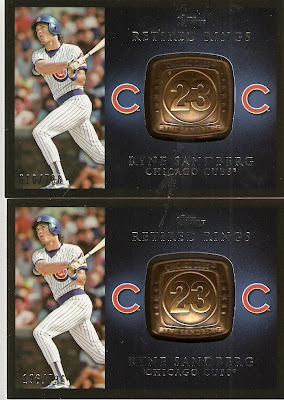 I had been trying for weeks to get my hands on a Ryne Sandberg Retired Rings card from 2012 Topps. Every time I placed a bid on one, at the last hour, I would always lose out at the last minute, or bidding would reach higher than I wished to pay. What I eventually did, was find 4 or 5 auctions and place bids that would take me to just slightly lower then the average going rate w/shipping. Well, sure enough my plan worked...... for two of them. I'll probably flip it on Ebay, that is, unless someone can make me a good enough offer. 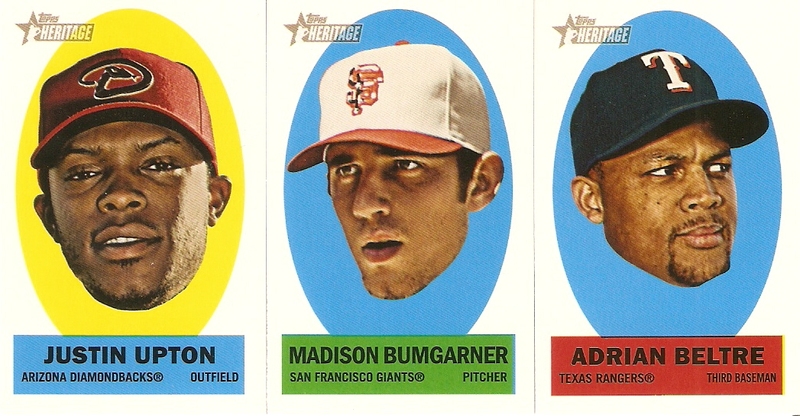 The next group of cards is from 2012 Topps Heritage. 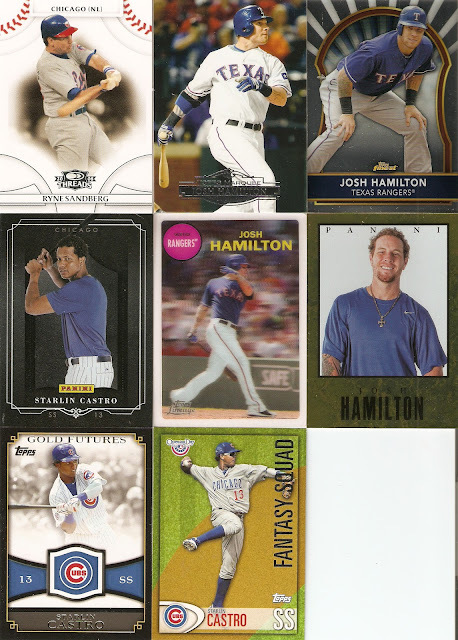 I got a Josh Hamilton SP, as well as image swap variations for Hamilton and Starlin Castro. 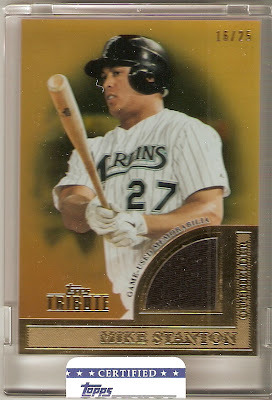 The Castro Chrome Refractor, I probably could have gotten sooner or later via trade, but I have no patience. The only non-Heritage card was the Hamilton card from Topps Gold Rush, which is a pretty cool-looking card. 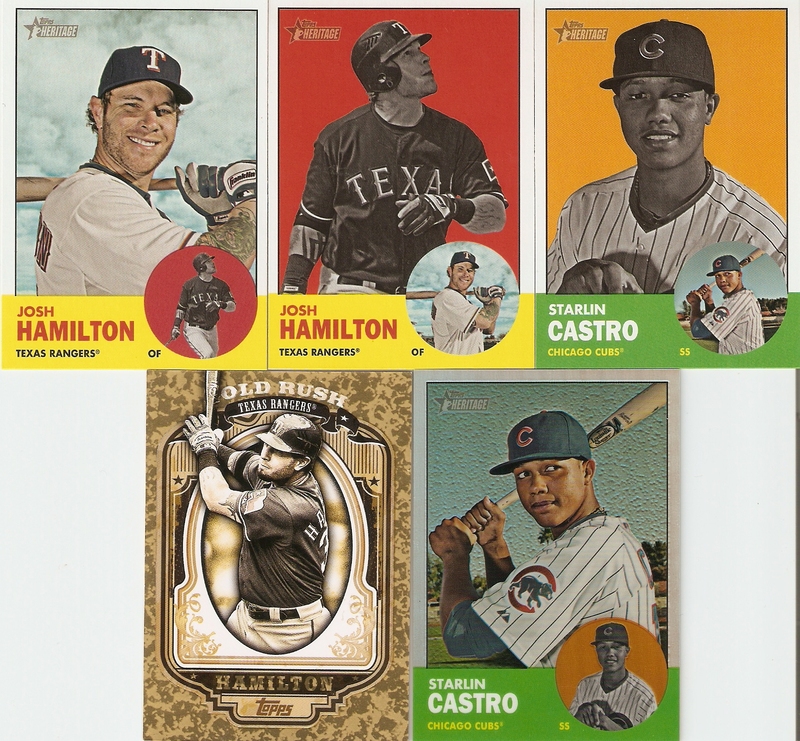 Now I just need to pick up the Starlin Castro from that set. Lastly, I decided to pick up a cool relic card of Rangers World Series hero Mike Napoli. The one I got was a dual-relic card from 2009 Topps Ticket to Stardom, serial-numbered 78/224. 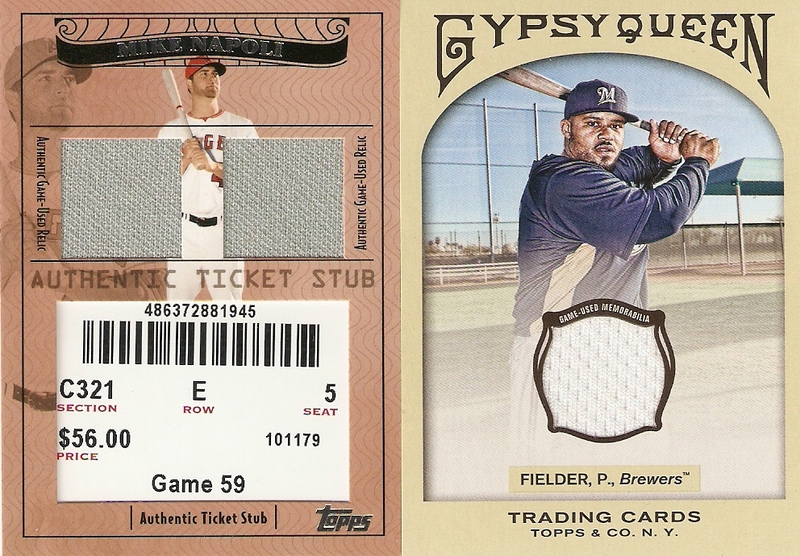 In addition to the game-used memorabilia, the card also features a piece of a ticket stub, which is a cool feature. 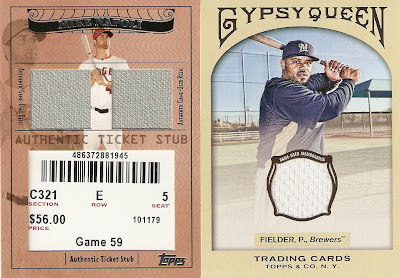 The Gypsy Queen card of Prince Fielder was an add-on for discounted shipping, and is up for trade. 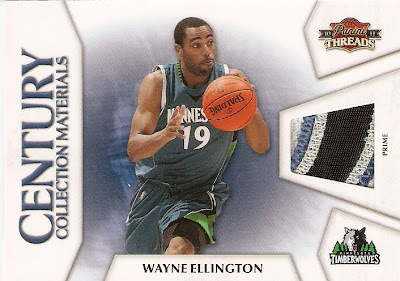 I just completed yet another trade with Greg at Plaschke, Thy Sweater is Argyle. Greg and I have completed quite a few over the past couple of years, and he always delivers some great cards in exchange of a few that I don't want anymore. This one was a simple 3-for-3 and gave me some fantastic cards to add to my team collections. The McGriff and Casey are staying around for sure, but the Ellington patch did force me to look at my basketball fandom. I had lived in Houston since 1993 and as a result of not caring about basketball too much, when push came to shove, I sided with the home-team Rockets. Now that I am up in Fargo, ND, I have to consider whether or not to stick with them or adopt the T-Wolves as my basketball team of choice. I really don't care that much about basketball, though, so maybe I'll just split allegiances. Who knows. Who cares. 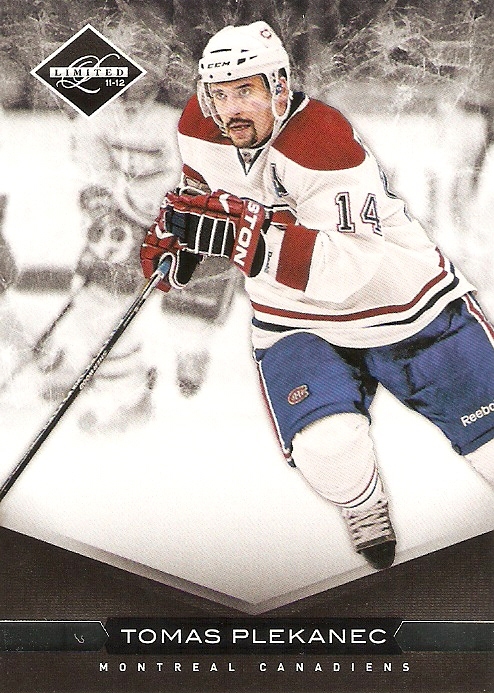 A sick looking card nonetheless. Thanks for a great trade! I'm sure we'll do more real soon. I made a stop to my LCS yesterday to pick up some packs, and walked out with a few singles as well. In addition to two packs of 2012 Topps Tribute (which I wrote about here) and a box of 2011 WWE (which I will be posting next weekend as a Wrestlemania-related post) I found some hits and a few cool singles. Here's what I walked out with. 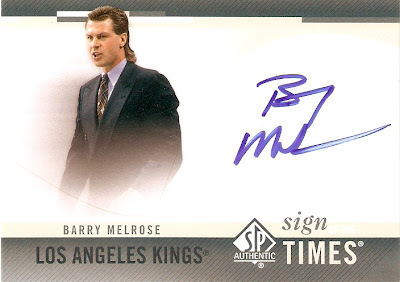 Melrose, as ESPN's main hockey analyst is one of the most recognizable faces in hockey, and is known for his trademark "hockey hair" mullet, seen on this card in all its early '90s glory. Melrose coached the Gretzky-era L.A. Kings to the Stanley Cup finals in 1993, where they lost to the Montreal Canadiens. 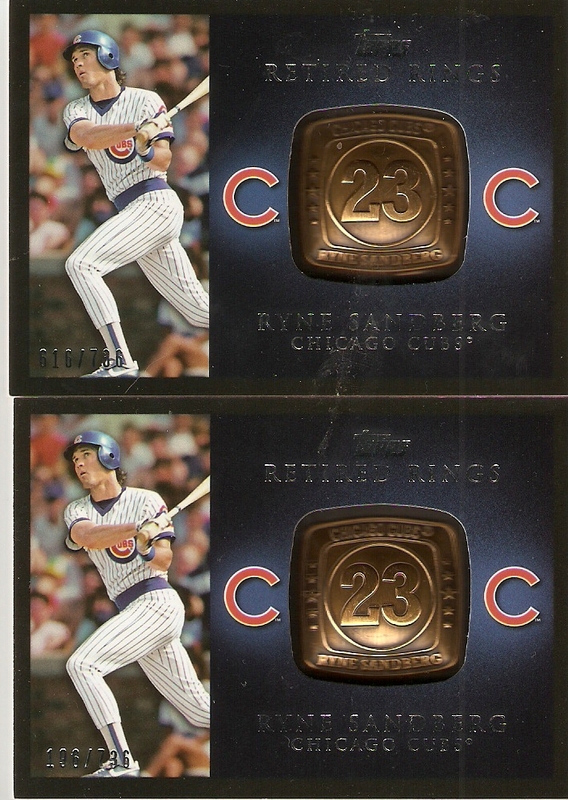 Not only is this a serial-numbered relic of my favorite former Cub, it is one of those early relic card which actually shows you a picture on the back of the actual item from which it was taken. 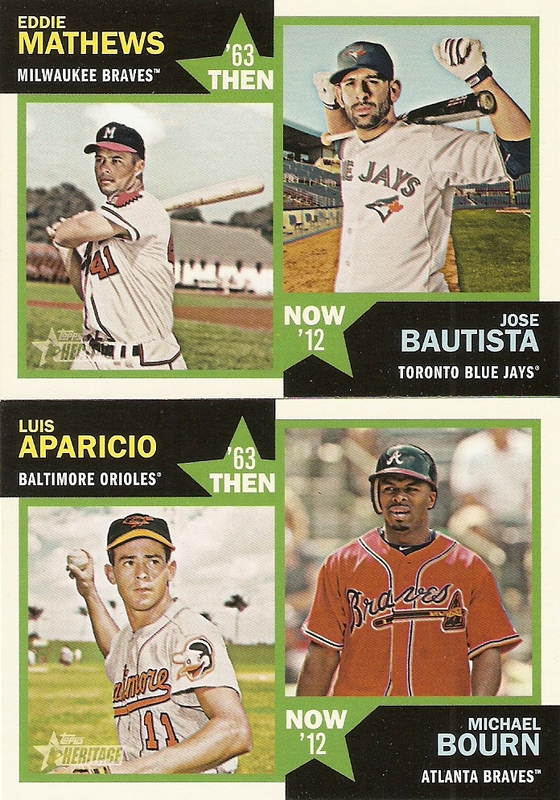 Of course, this was back before relic cards were as mass-produced as they are today, and companies could afford to spend the time on this. One of the things I love about being a fan of a pinstriped team is that I can find some really cool relic cards, such as this Castro. It definitely makes a home jersey card that much better, and the fact that the Lineage minis are great looking cards to begin with, just adds to it. Here, I just wanted to buy a few card I haven't really been able to acquire anywhere else. Nothing too special, but all of them are nice looking cards. 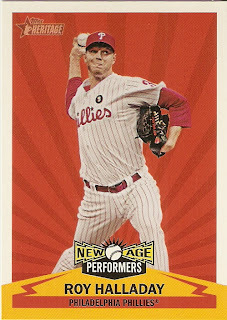 And for as much 2012 Topps as I opened, that Gold Futures card had eluded me for way too long. I just completed a simple 1-for-1 trade with Chris at Crackin' Wax. I had acquired a large GU?auto lot off of ebay to use as trade bait and he became interested in a Bobby Lanigan Bowman Chrome autograph. In return, he sent me a Frank Robinson Historical Stitches card. 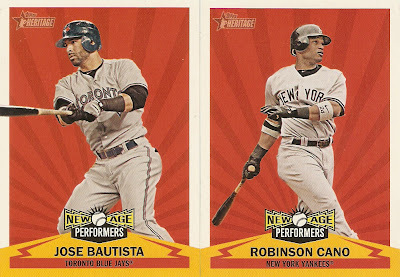 Ever since seeing these in person for the first time, I have been a huge fan of these cards. 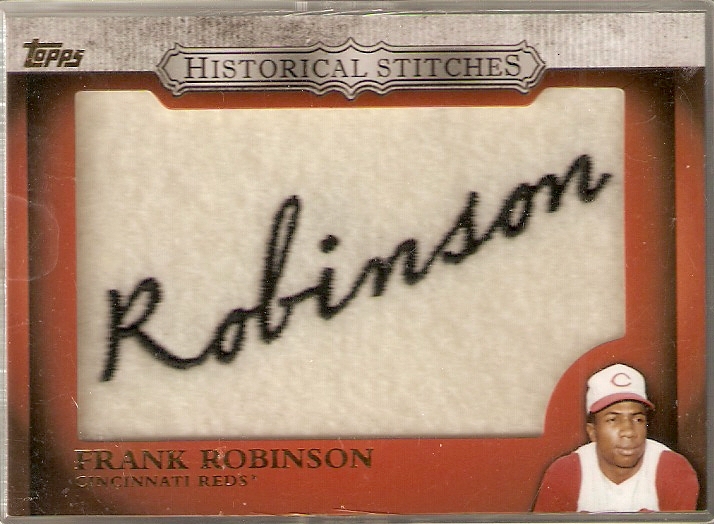 The Robinson joins Ryne Sandberg, Willie Mays, and Bob Gibson in my collection. 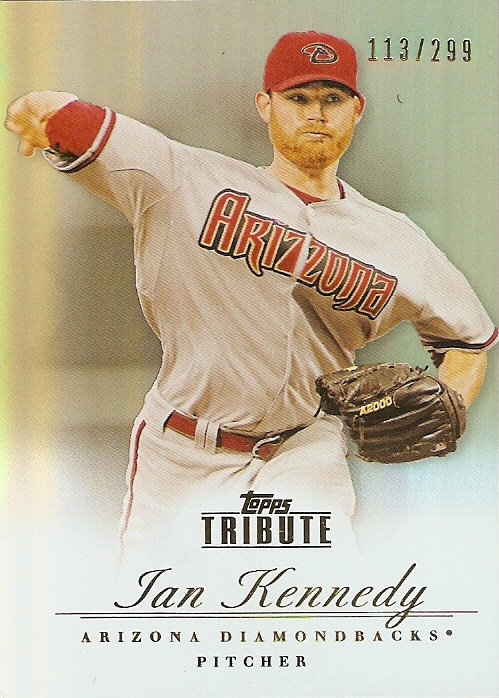 After seeing a post from The Daily Dimwit about 2012 Topps Tribute, I decided while at my LCS, to do the same and try my luck with what appeared to be a pretty cool product. 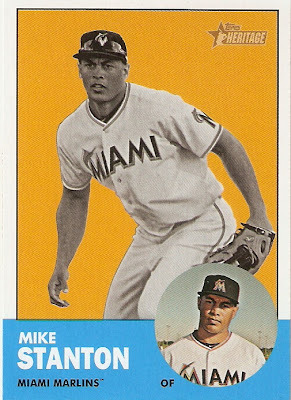 I usually stay away from the high-end stuff, considering that I can get the cards I really want off of Ebay for about the same price as the cost of a pack, but sometimes it's just fun to play the baseball card lotto. 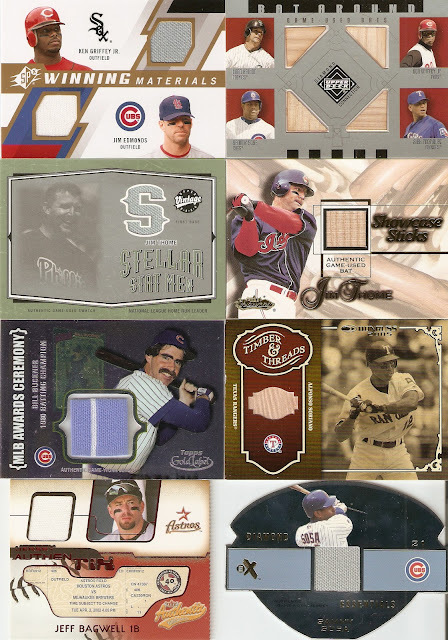 Each pack contains 5 cards: 3 base, 1 serial-numbered parallel, and one serial numbered relic/auto inside of a sealed plastic case. 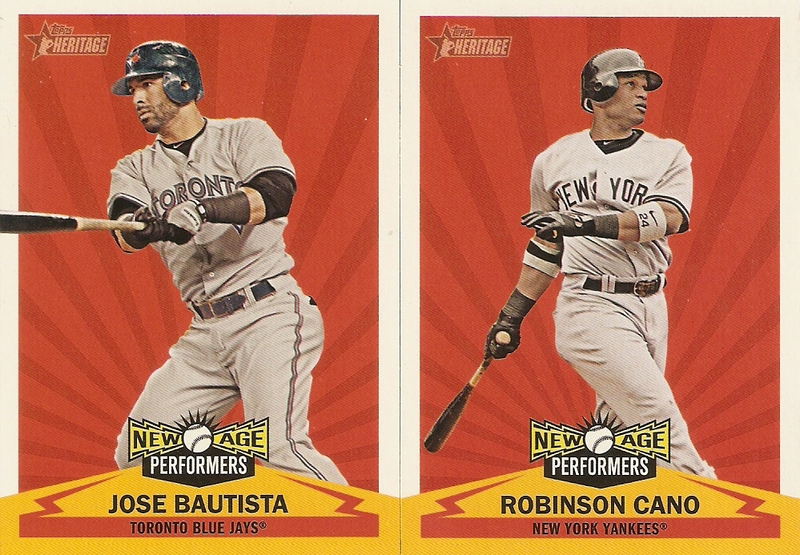 I must say, I LOVED the fact that the hits came already encased. Let's face it, that's what everyone will do with each one they pull, so let's cut out the middle-man, right. I like the effort, I really do, and that goes a long way in making this a great product. Anyway, here's what I pulled. Definitely a Mike Stanton hot pack! 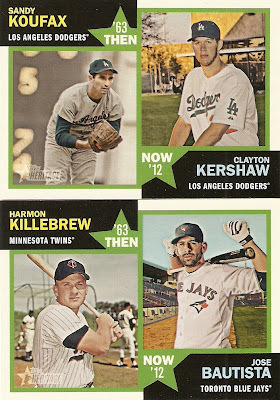 I'm not sure what it is, but I keep pulling this guy's cards, from 2011 Topps Heritage here and 2012 Topps Heritage here. 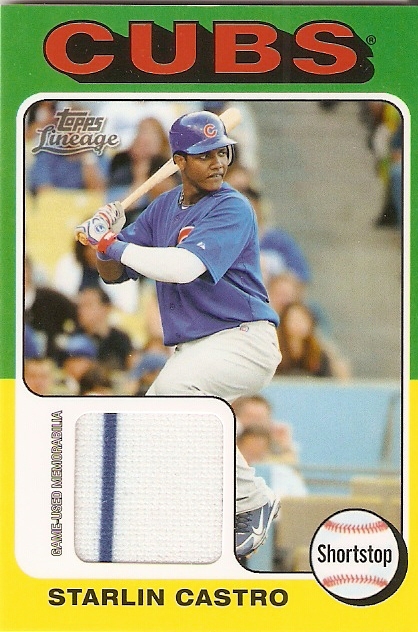 Still, the blue /199 parallels look fantastic, and any time you can get a colored jersey swatch on a card serial numbered to just 25, that's always a good thing. All things considered, I could have done much worse. Three great base cards, followed by one mediocre parallel, followed by a relic of a hall-of-famer. I loved getting a Cub. Out of 10 card, the odds weren't necessarily in my favor, especially considering that four of those cards are of two players. That being said, I REALLY like the Kaline relic. Now, of course, it's no Koufax or Mays, but this is a really nice looking card, and not a disappointment by any means. I'm not really a Tigers fan, but I might just have to keep this one, that is, unless someone can give me an offer to pry it away. I REALLY enjoyed opening these. 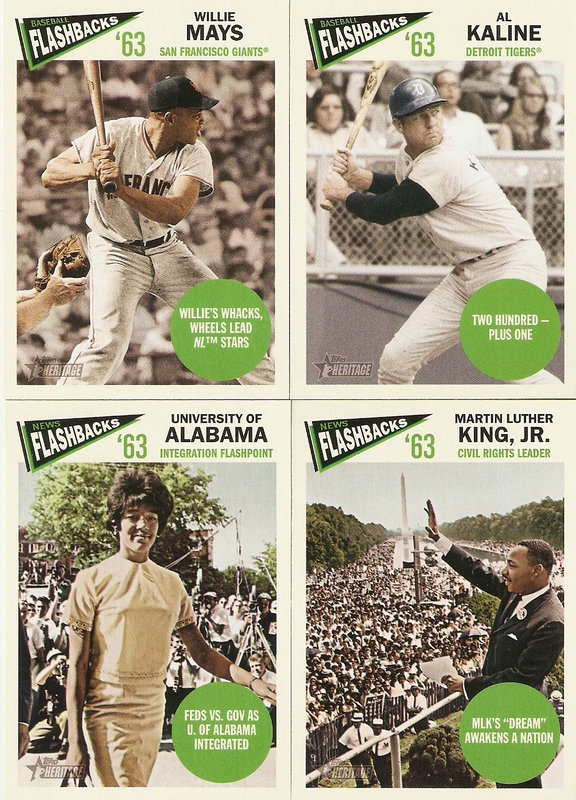 They are merely five-card packs, but the effort that went into making this a quality product shows through, and knowing that so much care went into the big cards makes this above all else, a FUN product to open. The price, of course, makes the fun times limited, but I had a great experience with these overall. 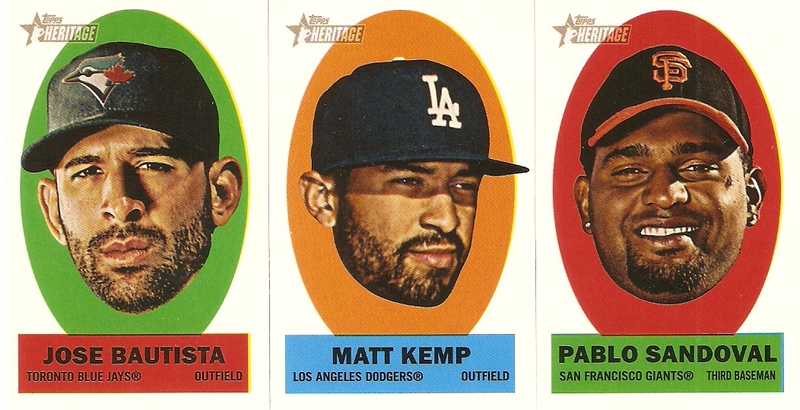 I wasn't disappointed in either hit, which to be honest, is a rarity. If anyone is interested in any of these, let me know. The Dawson is the only card off limits. While I don't necessarily need a Cub in return, I do want it to be something really cool. Got another couple packages int he mail from Ebay purchases. Here's a quick look at the loot. Most people who have commented on the Sandberg manu-relic have commented on the inaccuracy of the wool fabric, considering that Sandberg never wore those particular jerseys. 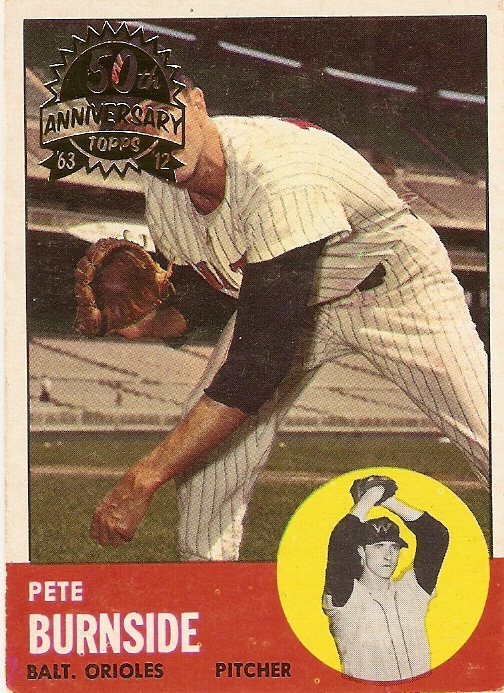 To that, I say, it's a cool-looking card, so who cares? The other two relics, I'm just simply fans of both pictures, and although I wasn't a fan of the Golden Moments relic design concept, it has grown on me. 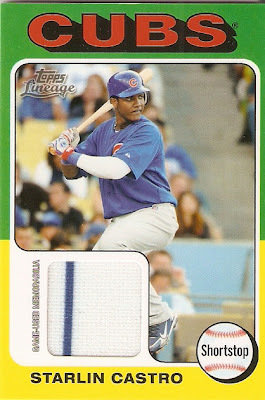 Not a huge fan of Big Papi, but this card does feature an interesting-looking swatch. I wasn't sure about it at first, but upon closer glance, it seems to be of a Sharpee on the jersey. Not sure if it was cut out of an autograph, or if the writing was just some other random thing. Either way, a cool-looking addition to the collection. 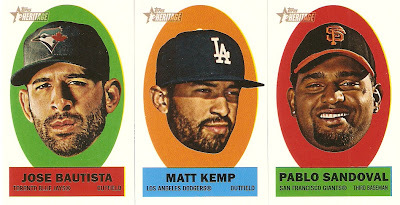 The other two were included in the three-card lot, and I don't care either way about them. Now I'm not a Sabres guy by any stretch of the imagination, but after watching the 2010 Winter Olympic Games, I became a HUGE Ryan Miller fan. 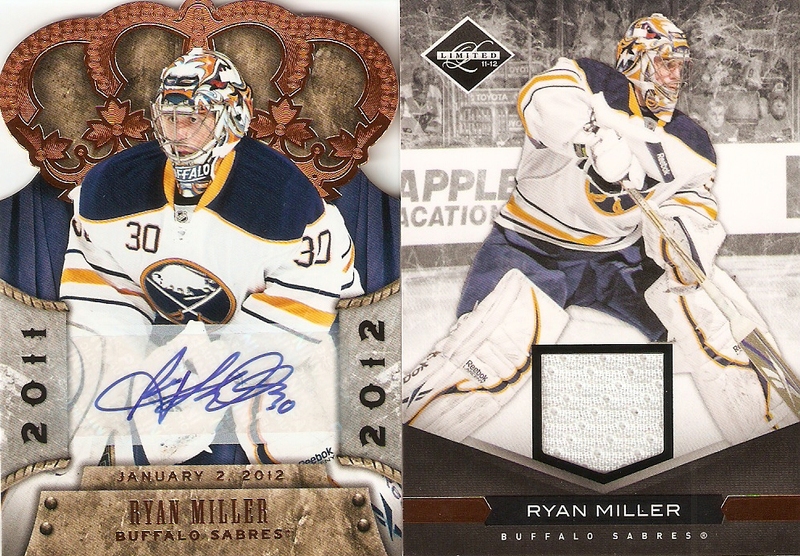 As the starting netminder for Team USA, Miller carried an overachieving American squad to a gold medal game, where they were one overtime goal away from taking it all. The big moment I remember, was after the game when they were awarding the medals, and calling each individual player by name, the Canadian crowd, who was ecstatic about watching the Canadian team win the gold, gave Miller a standing ovation when his name was called, to show respect for the effort he made. As a continuation of my first box break of 2012 Topps Heritage, here's what I pulled out of box number two. Historical Flashbacks: (2) University of Alabama, MLK Jr.
Well, there you have it. I am getting closer to completing this monstrosity, but if you can, head over to my want list and see what you can help me out with and we'll work out a trade. 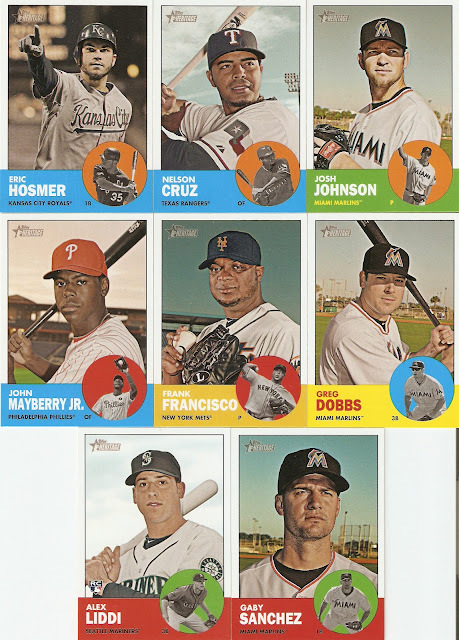 Box Topper: Kevin Gregg/Emilio Bonifacio/Johan Santana ad panel. 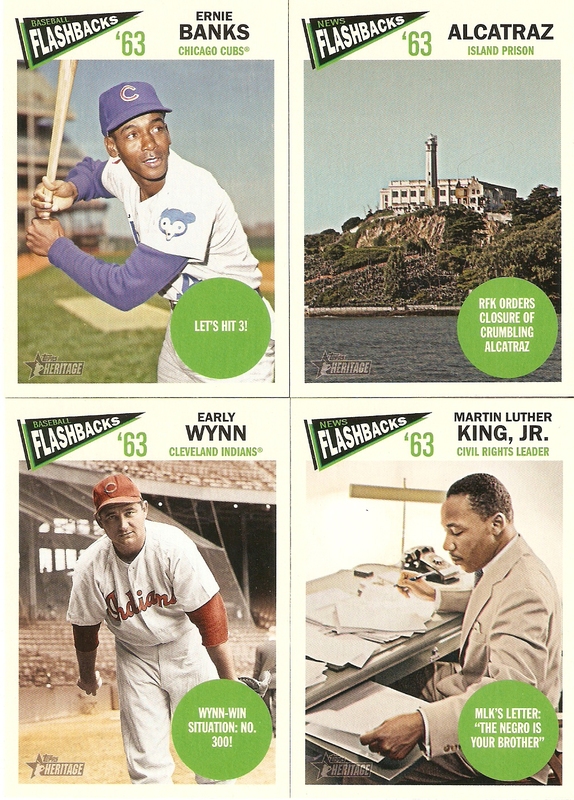 Historical Flashbacks: (2) Alcatraz, MLK Jr. There's what I got out of box #1. I have updated my want list with my needs from 2012 Heritage so take a look at it and if you can help me out, let me know and we'll work out a deal.